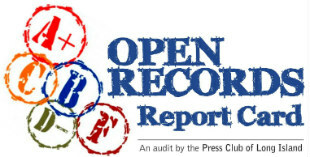 The Press Club of Long Island and Hofstra University presented a conference on New York State’s Freedom of Information and open meetings laws. The conference was one of the Press Club’s efforts to provide a forum on issues important to the public, including open government, the public’s right to access and governmental transparency. The panelists included, from left, Robert Freeman, Cliff Richner and Afreen Wright. At the lectern was the event’s moderator, Carolyn James, the Press Club’s Freedom of Information chairwoman. Roughly 50 people attended, most of them representing school districts, town and village governments, and civic organizations. They heard from panelists including Robert Freeman, executive director of the New York State Committee on Open Government; Afreen Wright, chief deputy town attorney in the Town of Babylon; and Cliff Richer, owner and former publisher of Herald Community Newspapers in Garden City. Many of the questions from the attendees helped to explain New York state’s laws, its limits and the responsibility of public entities in complying with the law.